“Bad-Off Boris & the Cupcake Cave-in”: Monster Inspired Book with “Universal” Concepts! With Chicago suffering yet another heat-wave, I guess I failed to realize that the end of summer is finally upon us. It didn’t actually hit me until I left for work one morning and kept getting held up by stopping school buses. Their sudden reappearance reminds me of big yellow whales invading neighborhood waters during a Fall migration. My kids are all back as well which means when I come home each evening I’m sure to see a stack of permission slips and teacher memos along with the usual barrage of ordering sheets courtesy of the various Scholastic Book Clubs. I completely disregard those books orders, though this wasn’t always the case. When my eldest son, Alex, started going to school I’d buy just about everything they had to offer. On the day his order arrived at his classroom, he’d walk home grinning as his big bag of goodies made him appear like the pint-size winner of “The Price is Right.” Of course this was just an added bonus as I, too, carried my head high amid fantasies of being “Father of the Year.” I reasoned that with every Scholastic check I signed I was insuring that my son would grow up to be the smartest and most literate child genius imaginable. As the years wore on, I started becoming more practical. Now, when my youngest son brings those ordering sheets home, they go directly from his knapsack to the trash can! Now before I get complaints from outraged parents & teachers, let me assure you that I am NOT against buying children’s books. Rather, I am simply pointing out that most of the stories offered seem like rehashes of the same thing and, furthermore, you can always visit your local library for FREE. Unfortunately I didn’t get that lesson until I went looking for shoes one day and somehow lost them amid a closet full of short paperback books. Well I’m happy to report that there is a new book out there that is NOTHING like the others and one we Monster dads (and moms) can cheer about! 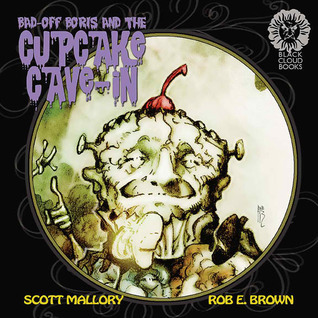 BAD-OFF BORIS AND THE CUPCAKE CAVE-IN, created & written by Scott Mallory and featuring artwork by Rob E. Brown, is the perfect addition to your child’s home library (even the bottom of my closet) and a MUST-READ this Halloween season! Not only does this book feature devilishly, whimsical illustrations along with a great story, but also a strong positive message! “Bad-off Boris” (a living cupcake with a more than passing resemblance to a certain Universal monster) enjoys the good life until he suffers an unexpected setback. Boris soon finds himself going from “admired” to pitied as his life changes in an instant. Just as he gives in to despair, his fellow cupcake, Bela (this is my kinda bakery folks), offers him an opportunity. Soon Boris learns that being “Bad-off” is much more a state of mind as opposed to any real circumstance. This is something many of the adults can take away after reading this to their own little monsters. Face it, we all have periods in our life when we feel “Bad-off” or have negative people in our lives who enjoy shaking their heads and reminding us of our short-comings. Boris & Bela illustrate that it’s how we respond to this adversity that ultimately defines us. 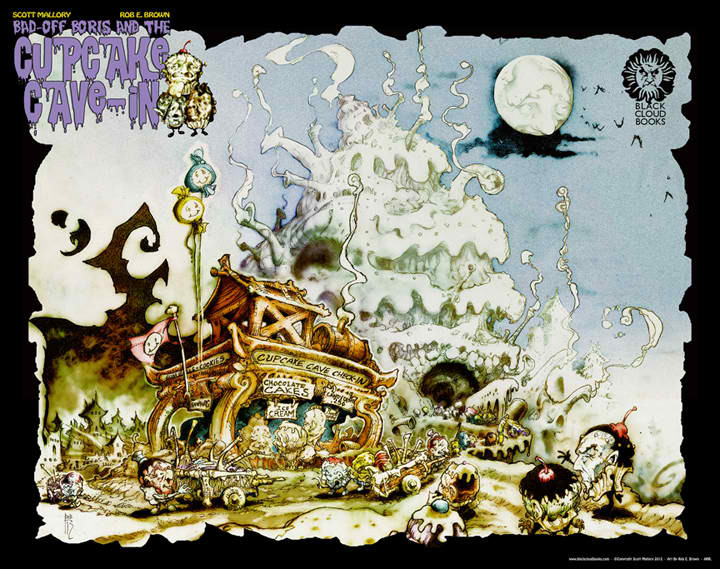 This book is a fun read and the art is incredible! Some of the illustrations are so rich in detail your child will want to study every page several moments after you’ve finished reading them (and not just because they’re trying to put off bedtime). I really enjoyed reading this tale to my 8 year old son and thought it was a lot more fun than the average fair. 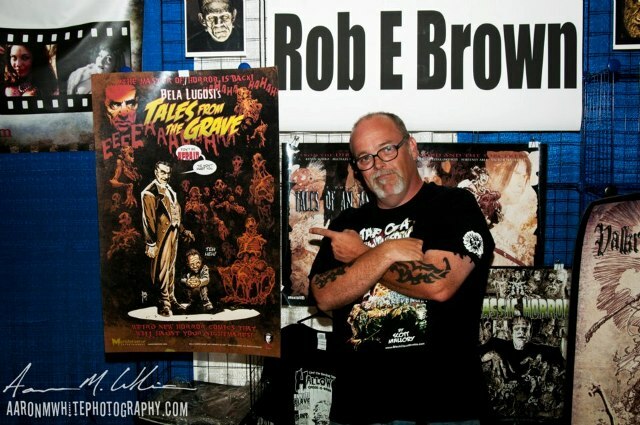 I recommend getting a copy whether your a parent looking for some fun Fall family reading or an old school monster fan looking for a unique addition to your collection. You will REALLY love this book! Trust me, after four kids, I’ve read enough of these to know! This entry was posted in Book Reviews, Monsters and tagged Bad-off Boris and the Cupcake Cave-in, Frankenstein. Bookmark the permalink. ← What Lurks Behind the Mask? I would read Cupcake Cave-In to my daughters. They are ages 9, 5 and 1.